WASHINGTON—His Holiness Karekin II, Catholicos of All Armenians, said Wednesday that the lawsuit filed last week in Turkey’s Constitutional Court by the Catholicosate of the Great House of Cilicia to regain ownership of the historic headquarters of the Armenian Church is Sis (currently Kozan), in south-central Turkey, a “positive” step. 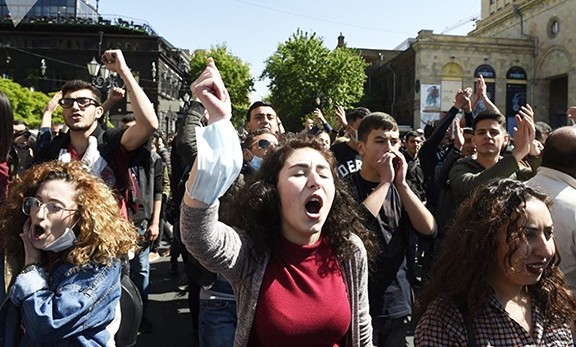 “We believe these are the first steps in order to continue the demand of the rights of the Armenian people,” said Karekin II expressing hope that the lawsuit will have a positive outcome. The pontiff explained that the Armenian Church holds properties, which were confiscated by Turkey during the Armenian Genocide and lawsuits such as the one filed last week seek to regain those properties and have it returned to the church. Karekin II said that the lawsuit was a positive first step to bring justice to the Armenian people. The Catholicos, who is currently if Washington to preside over and attend events dedicated to the Armenian Genocide Centennial, spoke to reporters via a telephone press conference on Wednesday afternoon and touched on other issues such as the conflict in Syria and the Middle East. Convinced that recognition of the Genocide and compensation should go together, His Holiness Aram I, Catholicos of the Great House of Cilicia on the year of the 100th anniversary of the Armenian Genocide, has filed the lawsuit In Turkey, thus setting a precedent for the descendants of the martyrs to reclaim their family belongings. Since 2012, Aram I has presided over a committee of Turkish and international human rights lawyers, preparing the current litigation. The committee will explain the lawsuit through two press conferences. Last week, leaders and lawyers representing the Catholicosate of Cilicia held a press conference at the National Press Club to discuss the lawsuit, whose lead international counsel s Payam Akhavan, a former UN prosecutor at The Hague. “It is a concrete demand for the return of property based on the rights of the Catholicosate, the legal personality of which was never extinguished, and it is about the right of religious worship. As someone who is not Armenian but who stands in solidarity with the struggle of the Armenians for justice, this is a remarkable story of hope; it is a remarkable story of the resilience of the human spirit 100 years after these abominable acts that there is still the hope to return,” added Akhavan. The Catholicosate of Cilicia settled in Sis, the former capital of the Cilician Kindgom, in1295, after moving from several places due to the political uncertainties in the region. In 1921, following the 1915 Genocide, the Ottoman authorities ordered Catholicos Sahak II Khabayan and the clergy to vacate the location within two days. The Catholicos and the clergy left the monastery in Sis, taking with them very few objects, such as the basin pot for the preparation of holy chrism (muron), some manuscripts and liturgical items. After moving between Jerusalem, Aleppo, Damascus and Cyprus, in 1930 the Catholicosate settled in Antelias.